February 7 – UEFA and European Club Association have signed a renewed Memorandum of Understanding until 2024 in a move that kills off talk of a European Super League. The European governing body has been very wary of a breakaway, money-spinning league that would involve the continent’s elite clubs and undermine its own flagship club competition, the Champions League. Last year German magazine Der Spiegel alleged that Real Madrid were exploring a 16-team Super League to kick off in 2021 outside the control of UEFA. In response FIFA president Gianni Infantino, who harbours his own aspirations of an expanded Club World Club, said that football’s biggest players would be banned from the World Cup if they played in a breakaway European Super League. UEFA has now curbed the threat of European Super League for the time being by extending the Memorandum of Understanding with ECA for another five years. 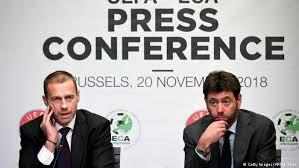 “Building on their close cooperation over the last 11 years, the memorandum outlines the strong willingness of UEFA and ECA to continue to work together with mutual trust and clarity of objectives to ensure the well-being and stability of European football,” said UEFA in a statement. The strengthening of the ties between UEFA and ECA can also be interpreted as a reinforced alliance against, and a signal towards, FIFA and its president Infantino, whose plans of pushing through with a $25 billion Softbank-backed investment to buy out some of FIFA’s competitions and rights to revamp the Club World Cup and introduce a Global Nations League have been met with great scepticism in Europe.